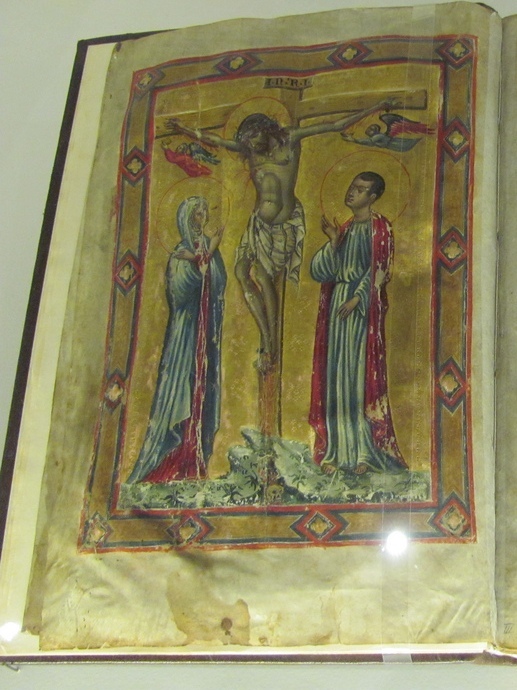 Good Friday: Man and woman, look on me! Man and woman, look on me! How much I suffered for you, see! Look on my side, from which blood drips. From pricking thorns my temples run with blood. You there shall find, all over, blood. Five wounds I suffered for you: see! So turn your heart, your heart, to me. in flesh upon a gibbet hung. as victim was he sacrificed. he dripped with water and with blood. that God did reign from on the tree. to touch so close such sacred limbs! were hung the ransom of the world! and bore away the prey of hell. that splendid triumph you applaud. and by his death restored our life. What use is Patristic theology? I mean, why read the Fathers? How does this stuff, this all-too-frequently high-flying, maximalist, cerebral theology help any of us in our daily lives? Well. Today I was reading The Orthodox Way by Met. Kallistos Ware. The chapter at hand was his chapter all about Christ, the theanthropos — the God-man. And while I was reading, some thoughts took hold of me. They follow, inspired by the Fathers and Met. Kallistos. First, let us consider the Person Who died on the Cross that Friday long ago. That Person, that God-man, that one-of-a-kind being was fully God and fully man. As my friend Pope St. Leo I says, he is complete in what is his own and complete in what is ours. Everything that could be predicated about God can be predicated about the incarnate Christ. So also everything about man — save sin. And, as Holy Scripture tells us, Jesus suffered everything we suffered except sin. He is, by the Scriptural record, fully human. He grew tired, thirsted, hungered — died. God the Word was eight days old and held in the arms of his mother (as per St. Cyril of Alexandria). Second, let us consider who God is. God, as we learn from the careful, prayerful reflection of the Fathers upon their deep reading of Scripture, is three persons. These three persons are co-equal and co-eternal and other suchlike things. They also are one, sharing a single essence. God, the one, true God of Christian monotheism, is also three. His existence is one of endless, boundless love, self-giving love at a level of intimacy we creations shall never know. We’ll never know this kind of love because each of us has only one essence per person. God, on the other hand, has one essence and three persons. It is not the sort of thing we can really even properly conceive. Jesus, then, was a participant in this divine life of self-giving love and shared essence. He took on flesh and became human without ceasing to engage in the life of the Trinity. Third, let us consider what this Person went through on the Cross that Friday long ago. Before he died, he went through enormous amounts of physical pain, torture, and suffering. Such is the stuff of many Good Friday sermons. Yet what else do we see him suffering before death? According to 2 Cor, God made him who knew no sin to become sin for us. That is intense. Jesus was the perfect human, not only in terms of being entirely human complete with body, soul, and spirit, but also in terms of sinlessness. And now, this sinless soul, this one and only human being ever to not sin takes upon himself the sin of the entire world. Think about how it feels to sin, knowing you shouldn’t. There is a definite feeling of sorrow, sadness. A feeling of separation. Separation from who you know you should and could be, from whomever you may have wronged in sinning, from God himself. This separation is what causes the cry, “My God, my God, why have you forsaken me?” One of the Trinity was crucified and died for us. He was cut off from the divine life that gave Him life. He was cut off from everything he had ever known. I don’t know how to express how powerful that anguish must have been because I can’t even express how glorious the love of the divine life is. What I do know is this — He suffered this separation and pain out of love for His creation. He suffered this separation, this death both physical and spiritual (for spiritual death is the separation of the human soul from God) so that we might have true life through him. This is victory, friends. This Good Friday, let us bless the Lord who loved us so much that He suffered the unthinkable. St. Cuthbert’s is worthy of a post itself. Yet as lovely as that place of worship is, we were there for Stainer’s choral masterpiece tonight. Jesu, Lord Jesu, bowed in bitter anguish, and bearing all the evil we have done, Oh, teach us, teach us how to love thee for thy love; Help us to pray, and watch, and mourn with thee. This choral verse is minor and potent, carrying the weight of the words of that prayer, the weight of our souls witnessing the anguish Christ suffered on our behalf. And when Christ is led away to be crucified , the singer has a rest, and crucified lengthens syllable by syllable, with the final line, ‘And the soldiers led him away,’ notable for its ritardando. Then there is a brief interlude while the organist plays music from Nintendo’s Dragon Warrior 4, suited for when Our Hero is in a village. The Processional to Calvary follows this RPG Village Music, and it is triumphal, with the choir singing the refrain: ‘Fling wide the gates! Fling wide the gates!’ Indeed, Christ is seen as the king here and now. This is his true triumph, not Palm Sunday. The oratorio took us from there, ‘The Mystery of the Divine Humiliation,’ to ‘The Majesty of the Divine Humiliation,’ both of which showed us the powerful Christological reality of what went on at Golgotha, to ‘God So Loved the World.’ John 3:16-17 were sung beautifully with a very full dynamic range from the very quiet to the loud, graced by lovely harmony. It was beautiful and regal, working from small to big. A far cry from banners at football games, but more fitting for the glorious truth of the Gospel. 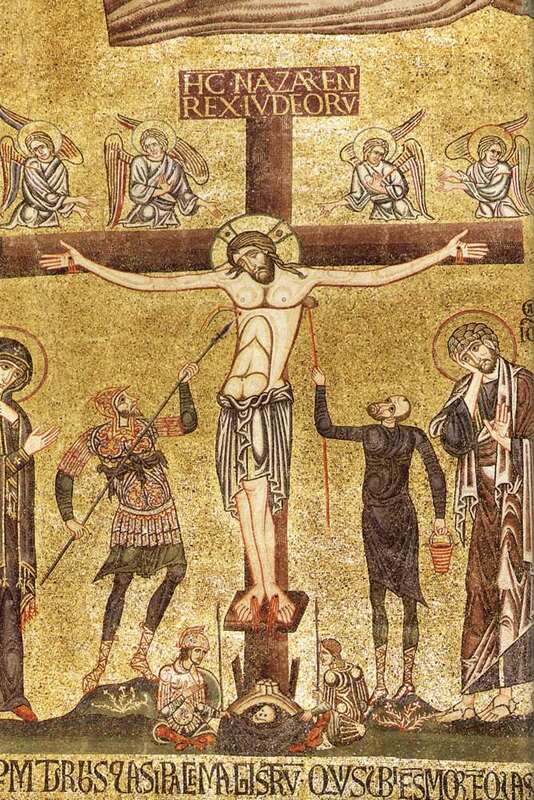 Another powerful moment came during the Recitative immediately following the hymn ‘Holy Jesu, by Thy Passion.’ The tenor sang, ‘Jesus said,’ and then the men of the chorus, sans organ, sang out, ‘Father, forgive them; for they know not what they do.’ The tenor and baritone proceeded from this moment to sing a duet about the wondrous fact of Christ seeking the forgiveness of his killers. The solo thief who mocked Christ was given short, choppy rhythm, whereas Christ’s, ‘Verily I say unto thee, today shalt thou be with me in Paradise,’ was sung by the entire choir in flowing (legato) loveliness. The music, again, suited the words. ‘There was darkness,’ was preceded by a deep, minor organ prelude. This Victorian choral masterpiece was certainly the highlight of my day! I hope it is a precursor to a wondrous week, filled with the good blessings given by the Crucified. Those looking for a Great Apostasy or papist idolatry need look no further. 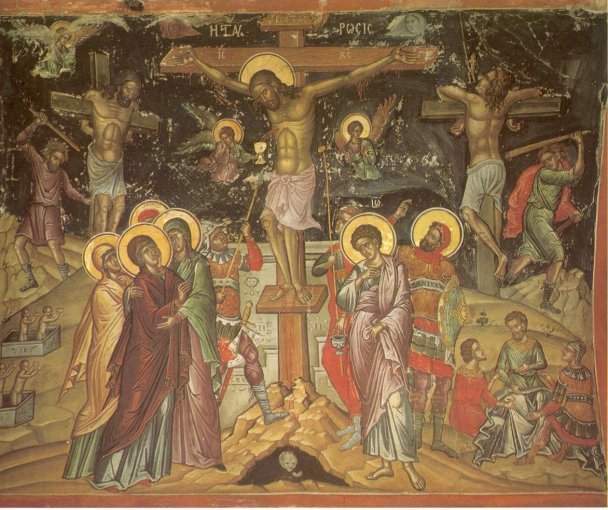 Those, however, with a discerning mind, will see here the cross being a symbol for Christ, for his atoning work achieved for us on the tree. What our foe intended for our ruin, an instrument of shameful death and destruction, has become for us the very source of life. Because of Christ’s sacrifice on the Cross 2000(ish) years ago, we can taste true life now and live forevermore after the Resurrection. This is the message of the Cross, the point of the image of the Cross as the tree of life. 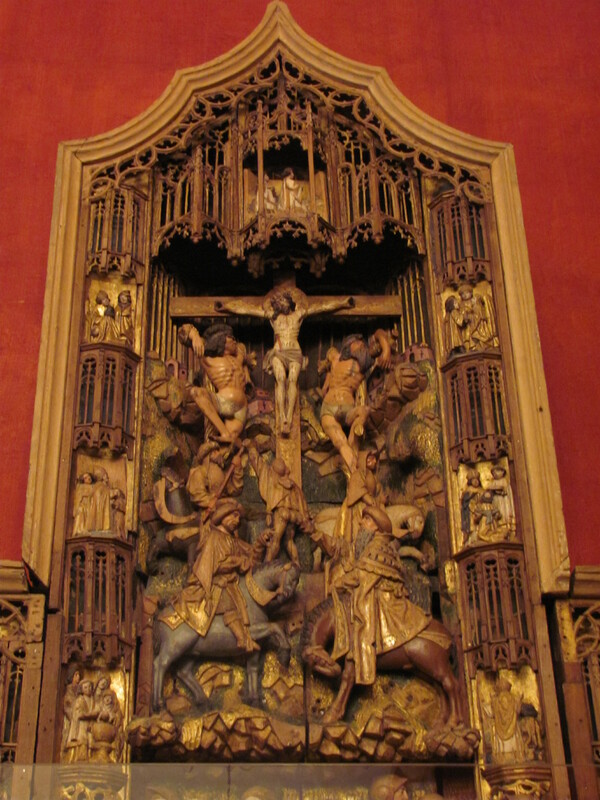 For those looking for other beautiful images of the Cross, check out the Dream of the Rood.